Tuna salad takes a delicious twist with celery, onions, lettuce and SINGLES. Served in fresh buns, these tuna salad sandwiches make an ideal packed lunch. COMBINE tuna, celery, onion and Miracle Whip; mix lightly. 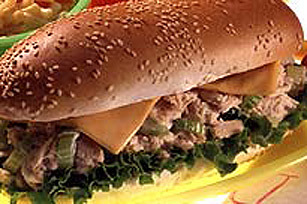 FOR each sandwich cover bottom half of bun with lettuce, cheese slices, tuna mixture and top half of bun.